Review by AllTheBestFights.com: 2018-01-27, fight not particularly good between Edivaldo Ortega and Drian Francisco: it gets two stars. Edivaldo Ortega entered this fight with a pro record of 25-1-1 (12 knockouts) and he is ranked as the No.19 featherweight in the world. He was defeated by Eduardo Ramirez in 2016 but he came back to win in 2017 with Tomas Rojas (=Ortega vs Rojas). His opponent, the former interim Wba super-Flw champion Drian Francisco, has an official boxing record of 29-4-1 (22 KOs=76%) but he lost two out of his last four bouts, against Jason Canoy and Guillermo Rigondeaux in 2015 (=Rigondeaux vs Francisco); he came back to win in 2017 with Mateo Handig. 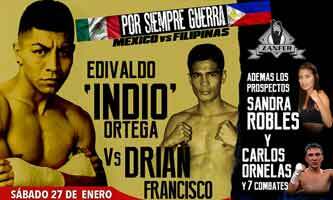 Indio Ortega vs Francisco is the main event of the evening. Watch the video and rate this fight!